Big Birthday Celebrations at Sprain Brook! As you can imagine, with multiple patients and residents at Sprain Brook, there are many birthdays to celebrate throughout the year. We want everyone to be able to mark the achievement, so each month we pick one day to celebrate all the birthdays. 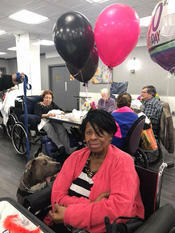 This March, we had the opportunity to celebrate two very big birthdays at Sprain Brook Manor! Estelle Fishburn turned 100 years old this month! Her family came to share in the celebration and so did her furry friend, Rocky. Estelle was one of 15 children and grew up on a tobacco farm down south. She loves to talk about her family and regales us all with tales of working hard on the family plantation. 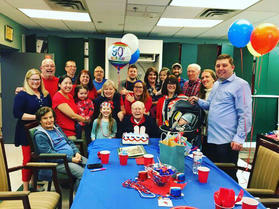 George Martin, another one of our wonderful residents, turned 90!He celebrated the big event surrounded by his children, grandchildren and great-grandchildren. That’s a big group! When our residents come to the dining room for their meals, they will often sit with the same folks. Estelle and George are usually dining together, along with their friend Edith, who’s 93. When we were chatting one day, George realized he was the youngest of their group. He gave me a smile and said, “I guess I’m the kid at the table.” Stay young at heart, my friends and keep smiling!